It is likely the Essedarius was not a true gladiator in the sense the murmillo or thraex was, this fighter was something slightly different. The term Essedarius actually coves anyone in a chariot, whether it was a chariot driver, or some one riding in it ready to attack. In the sense of what we are talking about today, the Essedarius in the gladiatorial sense referred to a gladiator riding a chariot against a standing foe. The Essedarius would ride their chariot towards their foe and initially try to run them over, if unsuccessful they could try to attack from their chariot with a spear or a sword. This class is very different from a traditional gladiator match and more typically resembles a more fun match up. Of course i use the word fun lightly, pitting a standing man against someone in a chariot might not have been fun for the standing man. However we know the gladiators sought fame and fortune, and a gladiator who bested a gladiator with a chariot and horse, that might be something that echoed around the Roman empire for decades to come. It’s noted that the Essedarius might have had a slave driver to assist them in their battle, giving them full chance to attack rather than focus on driving and attacking, surely a skill that not all possessed. Whether they steered the chariot themselves or had help, they would still have the same goal of winning in the amphitheatre. An essedarius gladiator riding his chariot, helmed by a driver. What weapons did the essadiarius gladiator use? Well this is an interesting question to answer in this case, because there were two traditional weapons they carried and a few more, shall we say alternative ones they could use. So let’s start with the traditional weapons first. The Essedarius typically carried two weapons, a spear to use to impale their foe from their chariot or even throw if they had a clear shot. Additionally they also carried a traditional Roman gladius as a side arm, which makes perfect sense. It was likely at some point their spear would break, be thrown or actually stick in their opponent. Without their spear the Essedarius would turn to their gladius sword, which they could use from both the chariot, and also on horseback or on foot too. The other weapons of this distinct gladiator are two you wouldn’t traditionally call a weapon. Firstly the Essedarius could use their horse as a weapon to trample or bull rush their opponent. 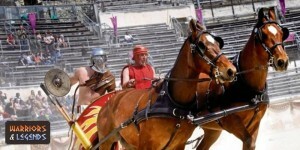 The sheer size of a horse would easily topple over a gladiator not paying all their attention to the match. Additionally the Essedarius would be able to use their chariot to ride into and over their opponent, the combined weight of the wood, metal and the rider would be enough to cause serious harm to anyone caught in its path. For the Essedarii the goal was simply, stay in their chariot and threaten, bully and harass their foe. Their first line of attack would be charging at their opponent with the aim of running them over, pushing them to the ground or killing them with a speedy impact. If their first line of attack did not bring results, the Essedarius could start to employ the use of their spear. With this they might be able to impale, wound, or even throw their spear into their foe. If this failed the Essedarius could bring out their backup weapon the gladius and launch a more traditional attack. The nightmare situation for the Essedarius and the aim for their foe would be to have them out of the chariot and on foot. In a foot fight the Essedarius might still have a chance, but for their opponent the battle would now be more even. It’s though that attacking the wheels of the Essedarius chariot was the best method to dismount them, but forcing them to turn at speed might also topple the chariot over. Additionally their foe could strike the horse, or even attempt to unsettle it. A scared horse could easily buck and throw the Essedarius from their chariot. It’s though that the Essedarius would if unseated form their chariot attempt to mount their horse, but of course this would not always be possible. A very unique gladiator, the Essedarii was sure to be a treat for the crowd should they fight. It was not likely common to find a gladiator that wanted to fight against a man with a chariot and horse, and we don’t know if they had any choice. Therefore this match up was likely relished and would be a test for the gladiator who fought on his feet, the Essedarius would have many ways to win this particular battle.